Coastal grizzlies can’t hide from global or local pollutants. The legacy of Persistent Organic Pollutants like DDT, PCBs and organo-chlorine pesticides continues to haunt both industrialized and remote regions of the planet. Despite a ban on producing many of these chemicals in North America, many of them continue to be used in Asia. There, they are released into the atmosphere, travel over the Pacific, deposit into the open Pacific Ocean, and accumulate through the marine food chain all the way to coastal North America.As a result, top marine predators like killer whales and polar bears have dubious distinctions as heavily contaminated animals. If these predators are at risk, what about terrestrial predators that feed on the marine food web? Could coastal grizzly bears be exposed to Persistent Organic Pollutants as a consequence of their reliance on Pacific salmon? To answer this question Raincoast teamed up with the Institute of Ocean Sciences and the University of Victoria. Our first task was to determine the level of contaminants within BC grizzlies and second, to see if there was a connection to diet. By measuring contaminants within the tissue of the bears, and using stable isotopes in the hair to understand diet, our results clearly showed that pollutant concentrations in grizzly bears reflects their consumption of Pacific salmon. 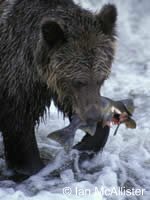 In fact, salmon are responsible for most of the contaminants within the grizzlies, and the greater the dependence on salmon, the higher the contaminant levels were. The good news is that compared to other top marine predators like killer whales, the level of POPs in grizzlies is relatively low. 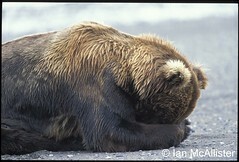 Exactly how low level concentrations effect grizzlies, especially at important developmental stages, is unknown. Of new concern however, was the presence of a pollutant group not considered a “legacy” chemical. It was a class of “emergent” chemicals called PBDEs or “brominated flame retardants” which are produced and used with fervor in North America. These unregulated PBDEs also act as hormone mimics in the body and were found in non-salmon-eating “interior” grizzlies in relatively high concentrations. The concentrations in grizzlies exceeded those found in Swedish women’s breast milk, levels which led to the ban of two of the three commercial PBDE products in Europe. These findings were published in Persistent Organic Pollutant exposure in BC grizzlies: the consequence of divergent diets -2005 (PDF). In 2007, we published the second paper in this study, Hibernation associated changes in persistent organic pollutants (POP) levels and patterns in British Columbia grizzly bears (PDF), which focused on the question “what happens to these chemicals during hibernation when the bear’s fat is burned-off”? Our study found that generally, pollutants in the bear’s body become concentrated as this energy source is utilized during the winter. Elevated concentrations of contaminants and metabolic products may be passed on to newborn cubs through consumption of their mother’s milk. In 2007, Raincoast submitted material to Environment Canada (EC) expressing our support for the Notice of Objection filed by the legal firm Ecojustice, on behalf of multiple NGOs. At the time, EC was proposing inadequate legislation for flame retardants that would continue to expose Canadians and wildlife to the toxicity and bioaccumulation risks associated with PBDEs. Their position was based on an incomplete understanding of the chemical behavoir, toxicity and persistence of flame retardants, specifically the heaviest of the flame retardants, deca-BDE. Our second study, and others that EC had not considered, made important findings on the molecule. As such, we were calling for a complete ban on the use, sale, offer for sale and import of all high congener BDEs (hepta, octa, nona and deca). Deca was the key, as the industry had pretty much agreed to phase out the others. Finally, in March 2009 Environment Canada made their decision which acknowledged the risks from Deca and broadened the scope of their legislation. While we still need to get to virtual elimination of Deca from plastics and textiles, the legislation went much further than originally proposed, eliminating the manufacturing (which there never was in Canada) use and sale of several forms of the chemical.